Summit Coffee, 128 South Main Street in Davidson, North Carolina is proud to present another session of the Summit Songwriter Showcase on Thursday, November 8, 2018 at 7PM. 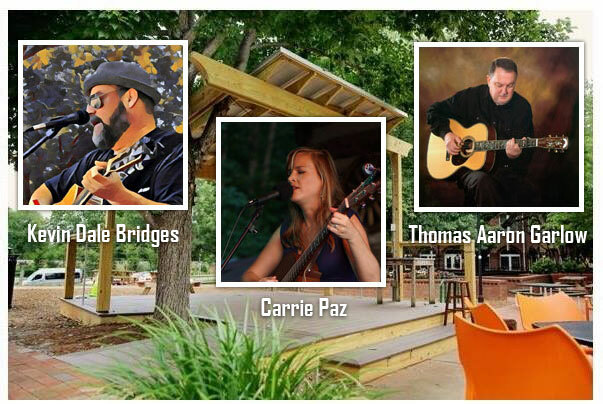 This milestone event will feature performances by the Charlotte area’s own Kevin Dale Bridges, Carrie Paz, and 2015 Summit Songwriter winner Thomas Aaron Garlow. Americana singer-songwriter Kevin Dale Bridges hails from the North Carolina county that produced bluegrass legend Earl Scruggs and country music Hall of Famer Don Gibson. He was selected to be a featured songwriter and performer at the 2016 Don Gibson Songwriting Symposium for his song, Carolina Sing-Along. Kevin weaves the rural working class cotton mill, Bible belt region of his upbringing into the imagery of his writing, creating songs of love, death and all that happens in between. Work on a full length album begins this summer. In the meantime, Kevin has released an album his demo recordings on BandCamp.com called Demos from the Fallout Shelter, allowing listeners access to the songs at various stages of production.